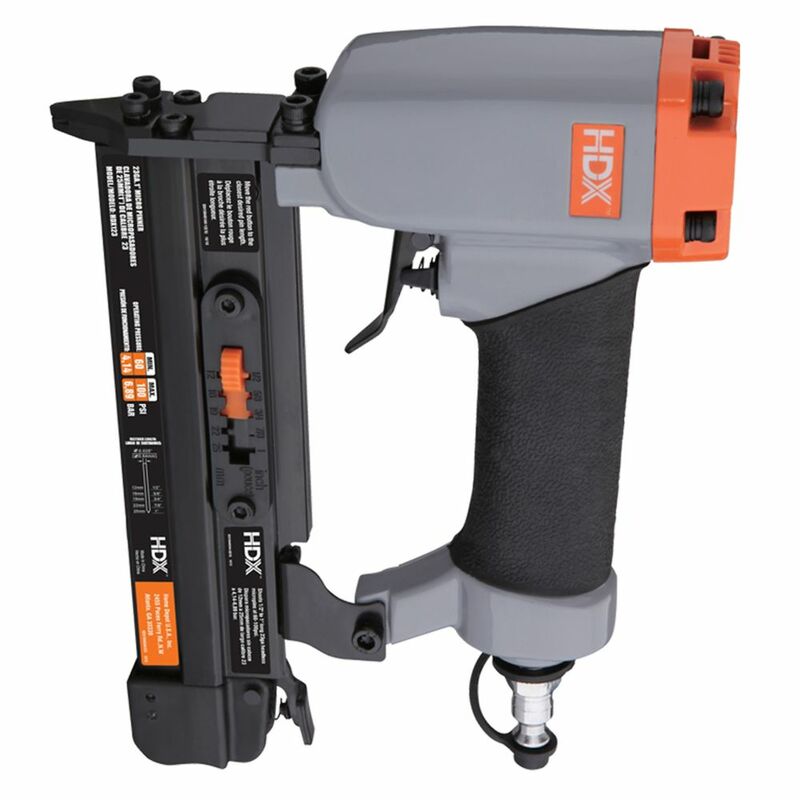 This HDX Pneumatic 23-gauge 1 Inch Strip Headless Pin Nailer is great for pinning in many woods such as jewellery cases, trim and hobby work. It is made of lightweight, die-cast aluminum for a durable tool that is easy to handle. The 23-gauge pins can range from 1/2 Inch to 1 Inch and are collated with glue. The handles have a comfortable grip for ease of use with no loss of control. The DEWALT D51257K 1-inch to 2 1/2-inch (25.4 mm - 65 mm) 16-Gauge Finish Nailer has tool-free depth adjustment, tool-free jam clear and tool-free 360 exhaust. Its motor works as oil free and oil lube unit. It has a low profile no-mar pad and trigger lock-off. It is lightweight, only 3.85 lbs. to reduce user fatigue. The Freeman Pneumatic 1-1/4-inch - 2 1/2-inch Coil 15-degree Siding Nailer can handle cedar shingles, roof, and wall sheathing, siding installation and fencing. The nailer features tool-free depth adjustment for fastening a wide variety of materials, side and front impact bumpers for safety and a 360-degree adjustable exhaust for clean, safe use. The nailer's body is made of lightweight and durable die-cast magnesium. For cost effective speed and power, use this magnesium NuMax Pneumatic Strip 21-Degree Full Head Framing Nailer. It is an excellent lightweight option for driving 2 - 3 1/2 Inch plastic-collated nails in projects such as framing, sheathing, remodelling and outdoor work. This nailer is designed for convenience with tool-free depth adjustment, an easy-load magazine and a 360-degree adjustable exhaust port. The driving mechanism is constructed to prevent dry firing. 23-Gauge x 1 Inch Micro Pinner This HDX Pneumatic 23-gauge 1 Inch Strip Headless Pin Nailer is great for pinning in many woods such as jewellery cases, trim and hobby work. It is made of lightweight, die-cast aluminum for a durable tool that is easy to handle. The 23-gauge pins can range from 1/2 Inch to 1 Inch and are collated with glue. The handles have a comfortable grip for ease of use with no loss of control. 23-Gauge x 1 Inch Micro Pinner is rated 4.1 out of 5 by 10. Rated 4 out of 5 by Crazylegs from Pin nailer works great. As others have mentioned it does... Pin nailer works great. As others have mentioned it does not have safety lock which i actually like. It forces you to get the nailer in position then pull the trigger. it also keeps you from trying to do a rapid fire like on a regular nailer. since it is used for finer more detailed work its fine. Rated 3 out of 5 by Tom from A simple basic pin nailer, no nail depth settings, which I like because the nails land exactly th... A simple basic pin nailer, no nail depth settings, which I like because the nails land exactly the depth I want anyway. I never had a problem but when I let coworker #1 borrow it, he was trying to go too fast and jammed it. I told him to give it a second between each nail. Months later I let coworker's #2 & #3 borrow it within 15 minutes of use the gun quit working all together. I don't know what they did, but as impatient as they were I can only guess. HDX is not high end, but if you take care of your tools you should have no problem. Recommend home use over commercial use. Rated 4 out of 5 by David from The pin nail gun is a nice tool. My only complaint is that it does not have a nail depth setting,... The pin nail gun is a nice tool. My only complaint is that it does not have a nail depth setting, other than that a nice tool. Rated 4 out of 5 by JimA from Use this with caution. There is no safety tip in this tool and it will shoot nails with a pull of... Use this with caution. There is no safety tip in this tool and it will shoot nails with a pull of the trigger. Having said that, it's a great addition to my pneumatic tools. Had it for about 2 weeks and used it every day. It leaves a very small pin hole in the wood which is very small compared to my 18 gauge nail gun. Great for trim work and hobbies. Easy to load and change pin lengths. Light weight and easily fits where other guns won't. Recommended. Rated 4 out of 5 by Seriously from The top end is a little heavy but, it doesn't... The top end is a little heavy but, it doesn't have a safety so it's much easier to work with. Pretty good product. Rated 5 out of 5 by JerryT from Exceptional Value I build small jewelry and presentation boxes and I find brad nailing the mitered corners helpful during glue up. the problem is the 18 gauge nailer I have leaves a pretty big hole to hide afterwards. This nailer is the perfect solution for this and any other application where a small nail is needed but hiding the hole is difficult. I used this nailer to build a couple of projects over the weekend and I found it performs well and leaves behind an almost indiscernible hole. One thing to note, do not apply heavy pressure on the tip when firing or the actuator that pushes the pin will leave a mark. A little practice first will help you figure that out. I've only fired about 50 pins through the gun so far but the operation has been flawless. No jams and the recoil is almost nonexistent. As for the value. There are much more expensive nailers out there but this one is doing exactly what I want it to do and it is priced as much as 1/2 of some of the others on the market. Bottom line - no negatives about this tool. It does the job it is intended to do and is priced to be affordable for the DIYer. A+++ tool that I'm pleased to have in my shop.